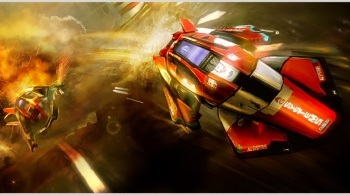 A cryptic Facebook message suggests that something is going on at shuttered Wipeout developer Studio Liverpool. Nearly 30 years after it first began operations, and 19 years after being acquired by Sony, Studio Liverpool - better known to some of us as Psygnosis - was closed down in August. I'd lost track of Psygnosis years ago, so it was a bit of a shock to learn that it had survived this long, albeit under a different name, but fans of the Wipeout franchise had far more relevant reasons to be unhappy with Sony's decision. But is it really gone? It seemed gone, and Sony sounded pretty unequivocal about the whole thing, stating bluntly, "It has been decided that Liverpool Studio should be closed." Yet earlier today, a rather odd message appeared on the studio's Facebook page and Twitter feed: "WE.ARE.ALIVE," accompanied by what I'm assuming is WipeOut 2048 concept art. There was much excitement, as many fans took it to mean that Studio Liverpool was somehow being reformed, perhaps as an indie or possibly elsewhere within Sony's organizational structure. The message wasn't terribly informative, but it was exciting, in the way that vague teases often are. But in a follow-up message posted a few hours later, the studio seemed to step back from that promise. "While we wait for news on the future of Wipeout, online play will continue to be supported and there will be plenty of Wipeout community events, giveaways and goodies to look forward to!" it wrote. "Wipeout's passion will live on - Together we are stronger and together we will keep Wipeout alive." That's not exactly iron-clad either, is it? The obvious implication is that Studio Liverpool remains cold and stiff, and that whoever posted today's message simply wanted the fan base to know that Wipeout, at least for now, isn't going anywhere. But you'd have to be pretty thick to put up a message like that without realizing that fans would take it as a sign that a studio resurrection is coming, and you'd have to be even thicker not to realize that teasing them like that, and then letting them down, would lead to disappointment and anger. Because of that (and my naturally conspiracy-minded nature), I'm inclined to think that maybe - just maybe - Sony's scousers have got something cooking.